Dr. Priyadarshi Jaruhar, Principal, K C Group of Research and Professional Institutes, Pandoga, Distt. Una, is an accomplished and erudite scholar in the field of engineering. He has a number of international and national papers to his credits and is an alumnae of NIT, Jalandhar. He has more than eighteen years of experience in the field of engineering education, research, training & placement and industry. 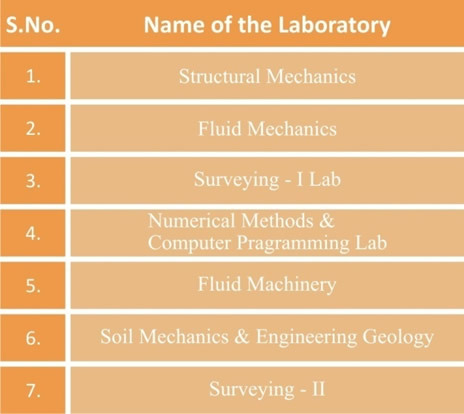 The following laboratories have been set up as per PTU syllabus and requirements. 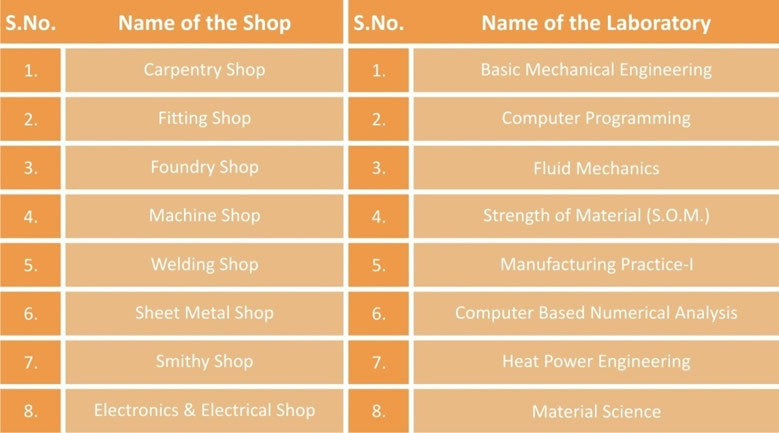 Welding Shop, Sheet metal Shop, Electrical & Electronics Shop, Foundry Shop. Hostel: Separate Hostel are available to.both boys and girls. The seats in the hostels are allotted on first come first serve basis. The rules of the hostel and related forms, a student is required to fill before admission, are given at the end of the prospectus. The Institute has provided Bus Facility to the day scholars and the staff members on reasonable and affordable fares. There is a provision for separate hostels for girls and boys. These are provided with modern amenities and state of the art facilities. The hostels have un-interrupted electric & water supply and adequate security arrangements with proper safety and security. There are ample facilities for sports activities. Students are encouraged to participate in sports namely Cricket, Volley ball, Basket ball, Badminton and Table Tennis etc. Our students participated in the games of Cricket, Volley Ball and Badminton in the “ Inter-Engineering Sports Meet” held on 17-19 April, 2010 at J.N. Govt. Engineering College Sundernagar. The Department of Applied Sciences caters to the teaching of Basic Sciences and Humanities to the Engineering students. It has well established labs equipped with latest and modern equipment. Stress is laid on Spoken English and Personality Development of the students. Quiz Competition, Group Discussion, Elocution etc are organized in the class regularly. It has qualified, experienced and dedicated faculty. The department is headed by Ms. Saneh Lata. The Department offers Under Graduate Programme leading to B.Tech Degree. The department has well established labs and workshops equipped with latest and modern machinery. It has qualified, experienced and dedicated faculty. The department is headed by Er. Ramesh Kumar. The Department offers programme leading to B.Tech degree in Electronics and Communication Engineering. The department has well established labs equipped with latest and modern equipment. It has qualified, experienced and dedicated faculty. The department is headed by Er. Amit Jairath. 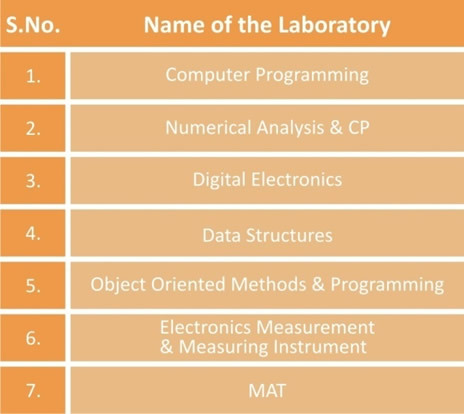 The department of Computer Science & Engineering offers programmes leading to B.Tech. Degree. The department has well established lecture halls qualified, dedicated and experienced faculty members, well equipped labs with the latest licensed softwares. It has 200 HCL Intel Dual Core CPU HDD 2180 @2.00 GHZ 1GB Ram having 24 hour 10 Mbps internet connectivity. All the computers are interconnected with LAN. The department is headed by Er. Mandeep Kumar Kashyap. The Department offers programme leading to B.Tech. degree in Civil Engineering. The department has well established labs equipped with latest and modern equipment. It has qualified, experienced and dedicated faculty. Criteria For Admission to Four Years B.E./ B.Tech. 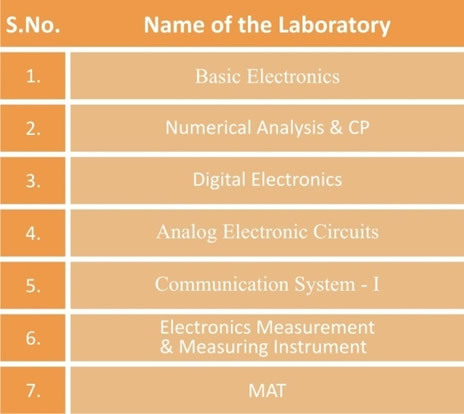 Degree Courses: The candidate should have passed 10+2(Class XII) examination or its equivalent from a recognized Board/ University with Physics and Mathematics as compulsory subject alongwith any of these optional subjects: (a) Chemistry(b) Biology (c) Computer Science (d) Bio-Technology. In case the seats in various Engg. Degree courses in Govt./Pvt. Un-aided Engg. Colleges remain vacant after exhausting / availing the AIEEE merit of rank / marks Obtained upto cutoff percentage (Para 3.1 (i) refers), then in this case the seats will be filled up by adopting the following criteria: As mentioned above under Para-3-1 with minimum of 50% marks in PCM Candidate will be admitted in order of merit. Thereafter as under: As mentioned above under Para 3.1 with minimum of 50% marks in aggregate in 10+2 examination be admitted in the order of merit. The candidate must be a citizen of India with good moral character The seats remaining vacant after last round of central counseling and 15% management quota seats in Private Un-aided Engg. Colleges will be filled up by adopting the above said criteria. Three years Diploma Holders in Engg./Technology or B.Sc. Graduates (with Mathamatics) passed with 60% marks in aggregate from a recognized Board of Education/ University shall be eligible for admission under Lateral Entry Scheme. Electrical Engineering/ Electrical & Electronics Engg. For admission to four years B.E./B.Tech. 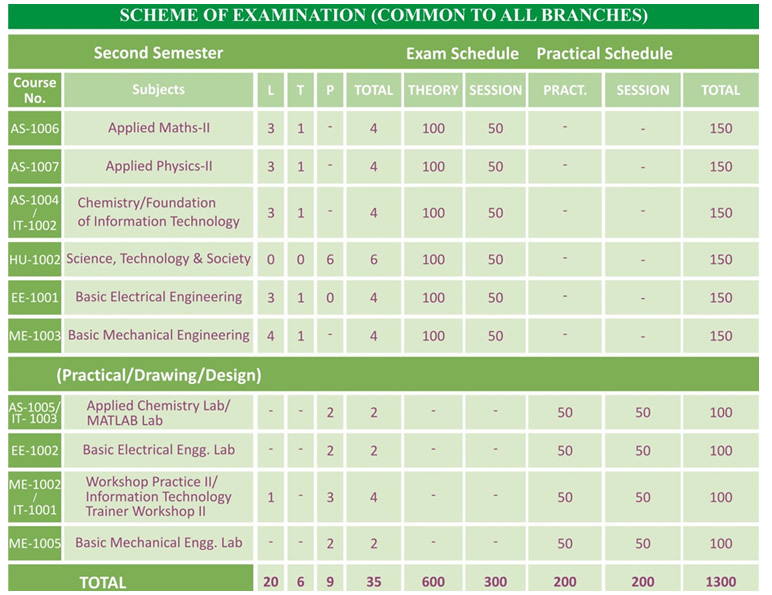 Degree course the candidate should have passed 10+2 (Class XII) examination or its equivalent from a recognized Board / University with Physics and Mathematics as compulsory subjects along with any one of these optional subjects: (a) Chemistry (b) Biology (c) Computer Science (d) Bio-Technology. Admission to B.E./B.Tech. 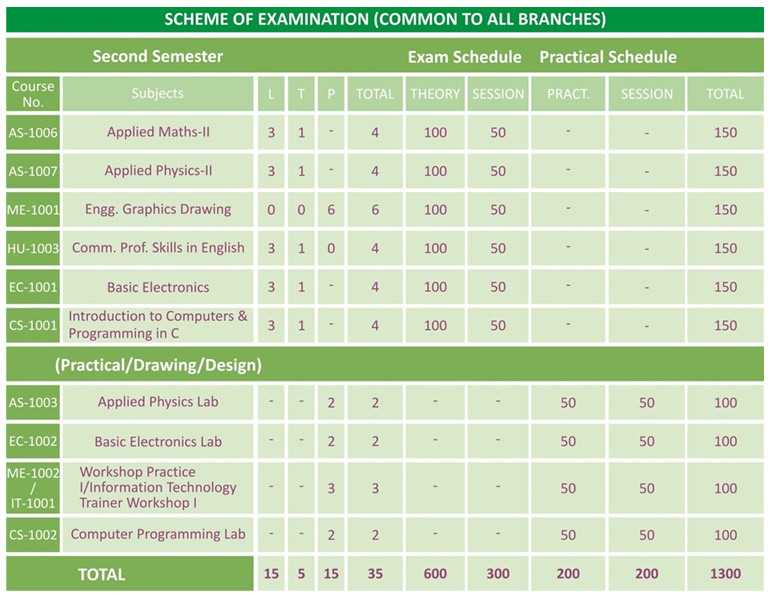 Courses will be made strictly on the rank / marks obtained in AIEEE-2010. The fee is charged as per norms of HP University Shimla and the notification issued by State Govt of Himachal Pradesh. The fee may be deposited either in cash with the office or by Demand Draft in favor of KC Educational & Social Welfare Society payable at Pandoga. Loans are made available to the needy and deserving students through the banks at reasonable rate of interest. These loans are repayable after the completion of course. 1. In Campus 4 week Vocational training for all branches will be held after the second semester and credit for the same will be given in the IIIrd Semester. In place of this UIIT will go for this 4 week vocational training during winter vacation at the end of 1st Semester. However, Credits for the same will be given in the IIIrd Semester. 2. Vocational Training consists of extended workshop training in shops of Carpentry, fitting, foundry, Welding and Electrical Workshop. 3. Course Nos. 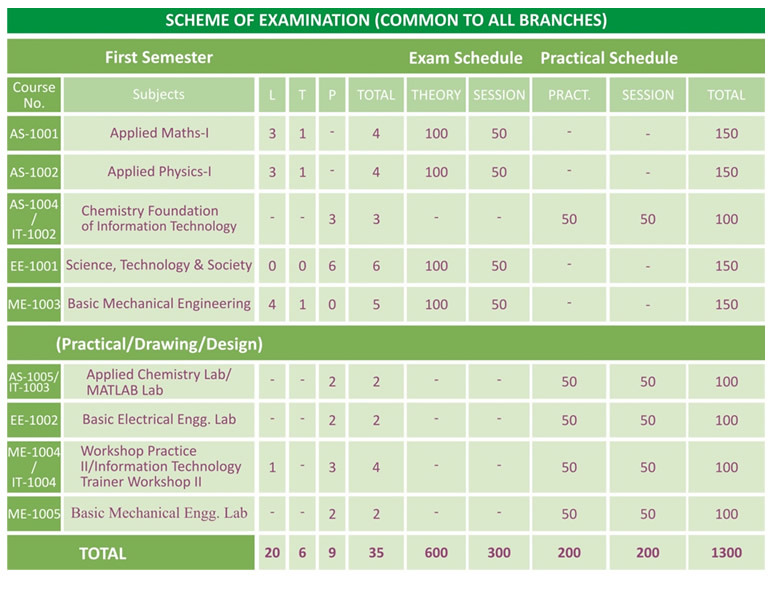 AS-1001 and AS- 1002 will be common for Groups A and B in First Semester. 1. University Institute of Information Technology (UIIT) will offer Information Technology Trainer Workshop I/II (IT-1001) (IT 1004) in place of Workshop I/II (ME-1002) / (ME-1004). 3. Course Nos. AS 1001 and AS-1002 will be common for Groups A and B in First Semester. 1	University Institute of Information Technology (UIIT) will offer Information Technology Trainer Workshop I/II (IT-1001) / (IT 1004) in place of Workshop I/II (ME-1002) / (ME-1004). 2	Course Nos. AS 1006 and AS-1007 will be common A and B in Second Semester. 1	In Campus 4 week Vocational training for all branches will be held after the second semester and credit for the same will be given in the IIIrd Semester. In place of this UIIT will go for this 4 week vocational training during winter vacation at the end of 1st Semester. However, Credits for the same will be given in the IIIrd Semester. 2	Course Nos. AS-1006 and AS- 1007 will be common for Groups A and B in Second Semester. The above mentioned tuition fee waiver will be given to meritorious students at the time of admission in the first semesters only. However in the subsequent semesters the above mentioned tuition fee waiver will be given on declaration of semester result subject to the condition that the student continuously keeps getting 75% and above marks in external examinations with no re appear in the external examination. If a student fails to get 75% Marks in any external examination he/she will not be eligible for any fee waiver in the subsequent semesters. 1. The students are advised to keep themselves aware of the College rules. Ignorance of rules shall not be an excuse for violation. 3. Late arrival and early departure at or from a class are recorded as absence from the class. 4. Students are expected to observe decorum and pay due respect to the faculty and supporting staff. Every member of the staff has authority to forbid disorderly behavior with in the college. 5. Students will not operate any machinery / equipment without the permission of the instructor. 6. Use of mobile phone is strictly prohibited. Strict disciplinary action (as decided by the principal) would be taken against student found using a mobile phone inside or outside the classroom. 7. No responsibility will be accepted by the college for any injury, loss or damage to the personal articles of students. 8. The students at the college require attention and diligence. A student neglecting his / her studies and having unsatisfactory progress will be given two warnings after which if he/ she fails to improve, he/she will be liable for expulsion from the college. 9. Students shall observe all safety precautions. The college is not responsible for any accident, of whatever nature, in the college, hostel, workshop, playground and during summer training and industrial training or educational tour/trip. 10. Students are prohibited to take part in ragging, politics or go to the press. Any student is found violating the rule, he/she will be expelled from the college. 11. The students will compensate damage to college/ hostel property/furniture caused by neglect or willful damage. 12. Students may note that fees once paid will not be refunded/ adjusted. 13. Students must keep their identity cards always with them and shall show the same on demand by any faculty/official of the college. 14. Students are permitted to form and carry on only such associations or clubs at the college as have been sanctioned by the Director-Principal. 15. Students claiming benefits/ concessions on medical grounds are required to submit medical certificate from a govt. hospital or dispensary. The certificate should be submitted by student concerned within a week of rejoining the College after illness. However in such cases there will not be any relaxation in the minimum attendance requirement to appear in the PTU semester examination. 16. Any student found under the influence of intoxication of alcohol/drugs in the College or in the Hostel is liable to strict disciplinary action which may be up to expulsion from the College. 17. The name of the student who fails to submit the university examination form for the semester in which he/she is studying without the approval of the Director-Principal shall be removed from the College rolls. 18. The students are advised to see regularly the notices displayed on the College/hostel notice boards. The notice displayed on these notice boards shall be deemed to have been served on the students. 19. Any student who fails to clear all the dues including hostel shall be debarred from appearing in semester examination. 21. At the time of admission a student has to undergo a medical examination and seek the medical certificate issued only by Medical Certificate officer, KC Group of institutions. 22. In case a student leaves the college before completing his/her studies, he/she is required to seek a final clearance certificate .